The Need for Speed: Is the Racing Post Top Speed (TS) Rating Useful? The Need for Speed: Should You Pay Attention to the Racing Post Top Speed (TS) Rating? It is all too easy to look at a horse’s supposed speed figures and immediately conclude that he is a contender or a no-hoper. After all, the fastest horse is going to win the race, right? Anyone who had studied UK racing in particular knows this isn’t the case. There are an enormous number of things to take into account including Going, Distance, Draw, Number of Runners and much more. 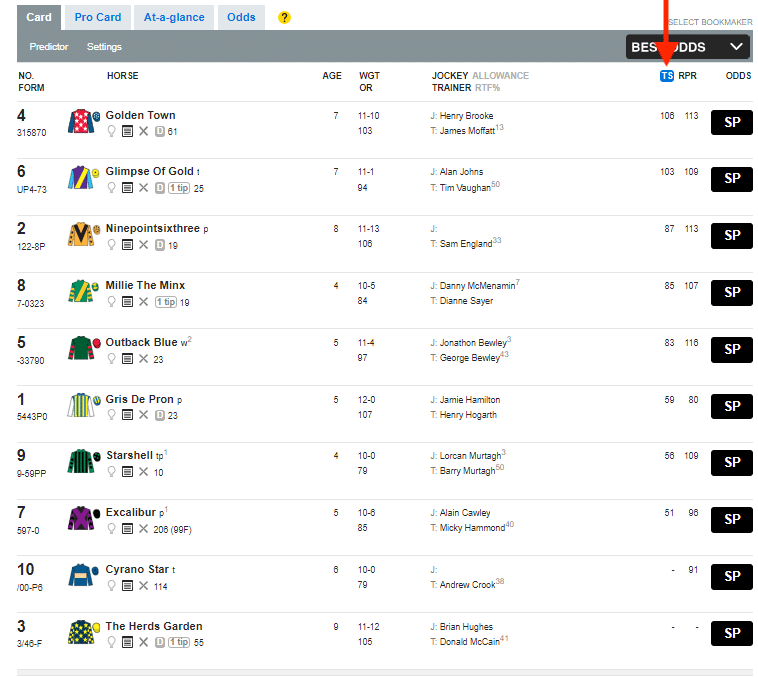 If you go to the Racing Post website and check out its card, you’ll see its TS (Top Speed) rating beside each entrant, if it has run often enough for the site to make the calculation. The beauty of these ratings is that the Racing Post has created a complex formula to provide you with an insight into a horse’s preferred conditions, along with its potential and ability. The TS ratings are measured in pounds and try to remove the obvious impact of weather conditions and various tracks on the times achieved by horses. In the past, UK punters dismissed the necessity of speed ratings in the belief they were only useful in American racing. The Racing Post’s hard work has changed the game for some, but are their ratings as effective as the excellent publication hopes? Clearly, the ratings are not perfect or else they would help you pick a winner most of the time. The company’s official explanation says that a horse with an OR of 100 in Flat racing can meet the publication’s Standard Time in truly run races on Good ground if it is carrying 9-0. Also, each second of a difference at five furlongs is equal to 22 points. In National Hunt races, the above list of ratings changes and applies to a mature horse with an OR of 135 that is carrying 12-0. A second of a difference every two miles is equal to six points. While this aspect of the TS ratings is relatively easy to understand once you take a minute to consider it, the actual calculation is a complicated matter involving overall race time, distance behind the winner, comparison to Standard Time, distance covered, Going correction, and a lot more besides. In other words, it is good that the Racing Post does it for you! As I already mentioned, speed ratings work reasonably well in America because there are similarities between most tracks. It is a very different story in the UK where a 7f race at Chester is very different versus a 7f race at Ascot for example. While the unique nature of UK races effectively guarantees excitement, it is a royal pain to try and determine if a horse can carry its performance from one track to a decidedly different course. This quirkiness extends to course distance. Did you know that at Newbury, 5f races are 34 yards too long? At Chester, a 7f race is two yards long, and so on. In UK racing, it is rare for horses to go flat out, even in sprint races. Therefore, you have to decide if a horse is coasting before a fast finish, or else it went too early and gassed out before the end. First and foremost, it is a BIG mistake to assume a horse with the highest Top Speed rating will win. I checked 13 races from two different cards at random, and only one of the winners had the race’s highest TS rating, an odds-on favourite! First and foremost, you should only consider the TS figure from the last 12 months. Ideally, you will only include ratings from races with a similar going. In the screenshot above, I deliberately chose a race a day in advance to avoid having my opinion coloured by the betting market. The red arrow is pointing to the TS rating. As you can see, Golden Town is the top ranked horse in the race A TS of 106 seems good on the surface, but how has the horse performed in the last 12 months? Suddenly, we see that the TS of Golden Town is a mirage. In Golden Town’s case, the horse’s best ever TS score of 102 was achieved on two separate occasions, many races ago. In National Hunt races, you should also distinguish between Hurdle and Chase races. You can also see that Golden Town has achieved just one win in 23 Hurdle races. Glimpse of Gold has a TS of 103, but once again, its relevant score is much lower. Even so, at 72, it is significantly higher than Golden Town’s effort. Ninepointsixthree’s TS is much lower at 87, but its relevant TS is also higher than Golden Town’s. Even Gris De Pron, with a highlighted TS score of 59, actually has a better TS than our supposed high scorer! Once again, it is a question of using a rating as a tool rather than as a cure-all. If you accept a horse’s highlighted TS score at face value, you will quickly haemorrhage money. That’s not to say that you should completely ignore a horse’s Top Speed rating. If you have narrowed down a race to two or three contenders, it could be helpful to analyse their respective relevant TS rating to see if you can break the stalemate. It may be a good idea to “paper trade” initially. 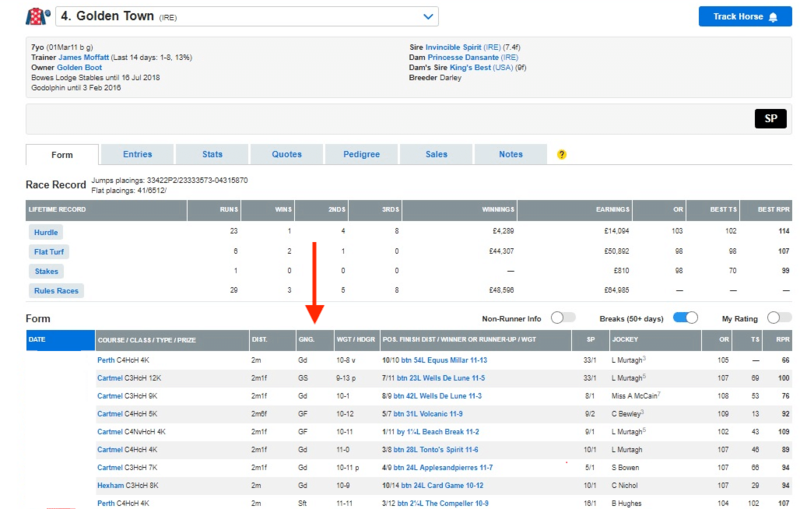 Cynics suggest you can also find non-triers on handicap debut; just look for horses from well-known stables that clearly underperform and check out their TS rating. A few years ago, Sir Mark Prescott’s horses had a habit of producing very low scores on their handicap debuts!